[carnage] Savington throws a rod, hilarity ensues - Page 3 - Miata Turbo Forum - Boost cars, acquire cats. Good luck getting it buttoned up Sav, hope you finish in time for [email protected]! If you haven't already, install a clutch bypass switch so you're not pushing the clutch in when you start the car. Will preserve thrust bearing life apparently. **** man, another. Sorry to hear it Sav. As far as 99 into 94 its basically a direct swap. I think people mentioned all the necessary changes you'll have to do. Source a real oil pressure gauge for the 99 block or make sue your existing one didnt get fuxored. The longer oil feed since you lose the driver side port. Use 94 throttle body and your will have to do something fancy with the throttle cable as it will be too long. either make a custom bracket or you have to wrap the cable around to the next hole. VICs - i didnt bother and I am not gonna bother when I do my 99 swap on my daily any day now. earlier block with the later head. just wire a megasquirt output to trip the VICS at 5200 rpm. slightly better than doing nothing eh? do the reroute now, and call begi for a new intake pipe. Your IAC settings will be different but you can copy mine, gut the vics **** and plug the holes with jb-weld, kill the EGR, and cut the valve cover so you can check timing on the fly. What about the throttle cable mount? I'm interested to see what happens to power, torque, and your spark table with the 9.5:1 compression. Sorry to hear Sav, but gl on getting it back on the track in time! Only thing that occurs to me offhand Andrew, is make sure there's a pilot bearing in the crank. I don't know about Miatas speficially but a lot of auto engines don't come with them, and I've seen a few get installed without. Seeing as an auto doesnt have a flywheel (therefor no pilot bearing) or a clutch, he shouldnt have a problem. Some card do have pilot bearings in the crank, but the Miata is not one of them. I think Sav knows this anyway though, Id hope anyway lol. You dont mess around dude, already out. I guess I could be fast if I had a decent place to work on them. Id be willing to bet that auto engine has seen less stress than a manuel may have. Good luck on the build. Seeing your old engines history makes me feel a bit better. Mine isnt nearly as high of mileage (1200 miles ) and probably wont see more than a few HPDE's in its lifetime, so Im not too worried. 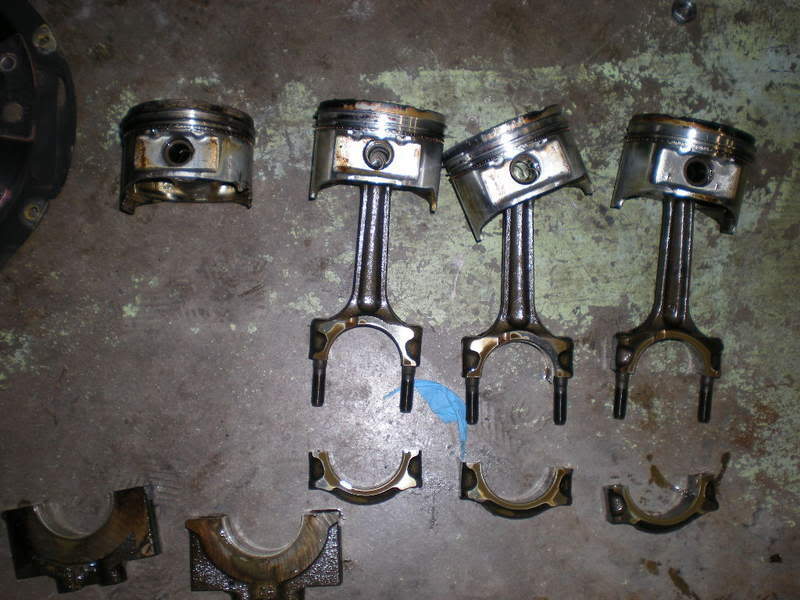 #1 (on the right) looks off to me, but it may just be glare up near the piston. Good luck getting it put back together. The more I think about it, the more I never want to deal with this again. Realistically, I have no 300whp aspirations. I'll eventually do a basic water injection setup and max the 2554R out completely, but I like the spool of this turbo and the largest I'll ever go is a 2560 if I do change. I don't think I need pistons; rods are the only thing I NEED to change, and OPGs are a paid-for safety item. I have neither the time nor the money to do a full build right now. The rods are $400ish, everything else should bring the total to around $700 including the water pump and timing belt. Reusing the pistons and rings lets me save 99% of the machining costs, and they don't really need to be changed anyway. I'm sure I stressed a rod at some point this weekend, and it let go on the highway. I was cruising, hadn't been in boost for probably an hour or so, and it let go. Fatigue failure. You will probably find the small end broken off with the classic signature of such. You may also find a few banana'ed rods. If you swap the rods, some people advocate a quick diy hone job and fresh factory rings. Just make sure the gap in the rings are big enuf for turbo work. With a very careful diy hone you don't need to hot tank the block. IIRC the better diy hone tool is the one with the bottle brush look (as opposed to the 3 long stones). ARP hardware isn't a must IMO - how many have seen fastener failures in a miata with <300 hp and <7500 RPM? Sounds good, all except the reusing the rings part. it may be ok for some, but I couldnt bring myself to do that. Why not just go buy a hone, and hone the block, use new rings ($100 maybe) and know it will seat well. I had no block machine work done to the cylinders and I honed them myself and used new Mahle rings and expect I have great compression (still havent checked yet). ^n/m. For sure try and find a bottle hone. I used one of the standard stone hones and found it to be a pain in the ***. I used to have a bottle hone (the ones that look like a round wire brush with ***** on the ends of the wires) but lost it apparently. I couldnt make the hone I used go all the way to the bottom of the bore, and I kept chipping stones by going too deep and hitting the castings in the crankcase under the cylinders. Plus with a stone type of hone you cant go all the way out of the cylinder and back in while keeping it spinning like you can a bottle hone, which leads to the crosshatch having curves from where you stopped and restarted up and down the bore. And why not just hone and spray it off with a cleaner and a high pressure hose. Of course you would have to remove the oil pressure sending unit and the other little stuff attached to the block first, but thats not a huge task. Are you running a dual feed fuel rail? Could that be the reason for failure in number 4? He is running a DIY dual feed modified stock rail. I don't see lean-ness or detonation there. I'm no expert (literally, I'm a dumbass non-engineer) but all signs point to fatigue from the pics. Like Jason said, I'm liking the idea of a quick hone and new stock rings. While the rings are off, it'll give you a chance to better inspect the pistons, clean up the oil holes and ring lands, etc. I can't imagine that a shop would charge you more than $72.50 to run a hone down the bores. Since the block itself is completely torn-down at that point, go ahead and hot-tank it, clean out the oil galleys, etc. No point in not doing it, etc? Honestly I would just drop in the stock motor and run it. Once you start ******* around with replacing this and doing that you end up sinking in more time and money than you wanted too. When is the track day? How much time do you really have? 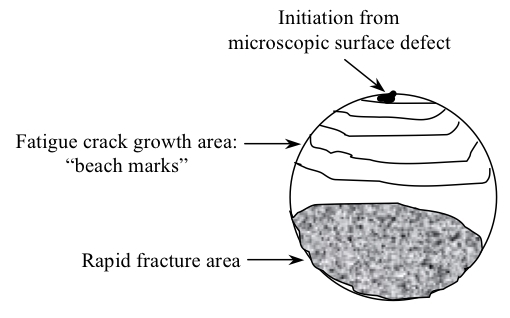 Look for the initiation site, then the 'beach marks' or striations leading out from there, then the catastrophic failure area which is rough looking. I could not look for this on my rod because the broken ends were so beat to **** it would have not been visible. Last edited by ZX-Tex; 03-03-2009 at 10:33 AM.